psychedelicatessen: What's Rangoon to you is Grafton to me. 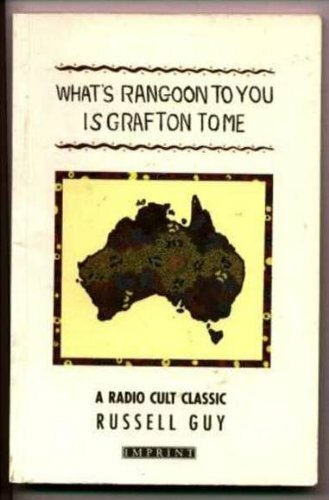 Here you will find recordings of What's Rangoon to you is Grafton to me, a psychedelic road journey from Brisbane to Sydney written by Russell Guy and featuring the voices of James Dibble and Russell Guy. 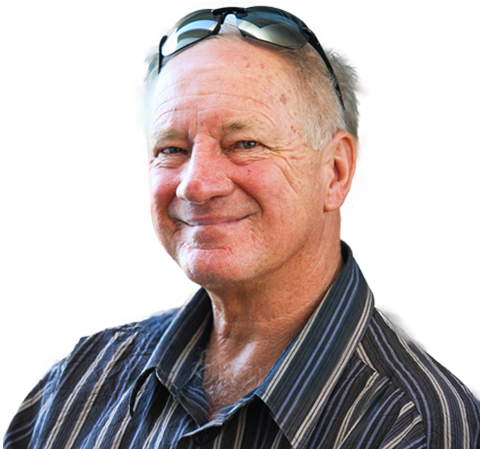 The story is a quintessentially Australian gonzo rant, tracing the narrator's twisted journey down the East coast of Australia. He was the perfect hitch-hiker: entertaining but mute in all the right places. He never once complained about the steel girder of static satire that was masquerading as 2JJ's programme on the speaker box on the back seat. I think he even got a kick from the jumper leads I'd rigged under the dash. He attached the positive to his forehead and stuck the negative in his mouth before jerking around the front seat like a vegetarian in a butcher's cold-room." So pull up a seat, adjust the viewing screen of your Holden windscreen and tune in. The text was available here but seems to have disappeared. I thought that might happen so I made a copy. There's also a book available, though it's a bit hard to track down, which has other short stories as well as the script to the radio play. The ISBN is 0207171661 and it was published by Angus and Robertson in 1991. (ISBN thanks to Gordon Mann.) Apparently the bookshop I've linked to is out of copies, so good luck hunting it down! ABC Radio National have a transcript of the radio play up on their site. The audio is available in mp3 format. It's a 40 megabyte download. This audio version was recorded directly to DAT from Triple J's broadcast of it in July 1998 and transferred digitally to the computer for encoding. This version is slightly different from the original. For starters it has been remixed into stereo from the original mono. With big thanks to Louise McLeod. I had (another) doh moment and managed to delete the file. Fortunately Louise's friend had a copy lying around and was able to get it to me. Anthony Gilbert edited my recording to remove the intro and outro. Another radio play was produced by the same team called Hot bananas. In my opinion it doesn't match the mastery of Rangoon but is still quite worthwhile. Edwin Scribner got me a copy of this. The quality isn't great but it's listenable. Apparently it's missing the first 30 seconds of the intro. Russell Guy originally wrote Rangoon in 1978 for Tracks, a surfing magazine. From 1976-77 he hosted Double J's breakfast show. He's since written a number of books and works as a journalist. You're interested in more information on Russel Guy? Last I heard (and this was in the late 80s) Russel was working as the manager of the Aboriginal band, "The Coloured Stone". But you might know that already. Tony also supplied the scan of the AIRTP graduation list to the right. 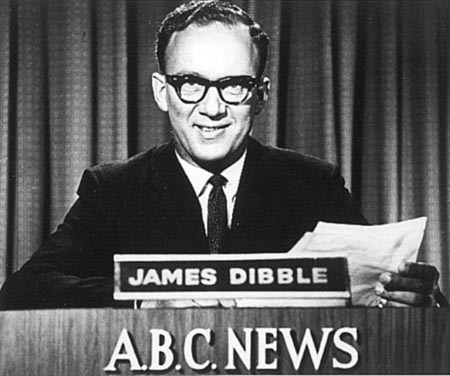 James Dibble was the newsreader for ABC Sydney from 1956 until 1983. His main claim to fame was that he was ABC TV's Principle Newsreader in Sydney from 1956 to 1983. I also once heard his voice on a recorded typing speed test. Garton's headlock samples Rangoon. The artist received a call from Russell Guy and congratulated him on using and releasing the work, with the samples. He seems to be happy that the piece continues to have a life. I'll send any updates or info I discover to this mailing list. So sign up and get occasional updates. If you have any more information about these artists or works, I'd be keen to know.